A.J. 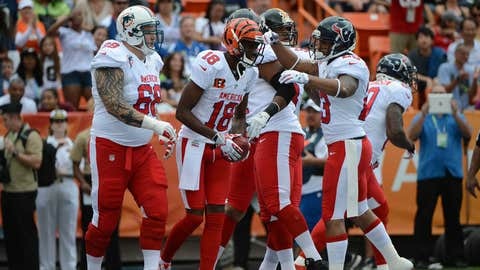 Green is congratulated by AFC teammates for catching a touchdown pass in the first quarter against the NFC during the 2013 Pro Bowl at Aloha Stadium. CINCINNATI — Bengals wide receiver A.J. Green has been selected to his third consecutive Pro Bowl while linebacker Vontaze Burfict has earned his first Pro Bowl selection, the NFL announced Friday night. The Pro Bowl will be played at Aloha Stadium in Honolulu on Jan. 26, one week before Super Bowl XLVIII is played. Instead of the traditional AFC vs. NFC format, players have been chosen without regard to conference by a vote of fans, players and coaches. They will be split into two teams by honorary captains and Hall of Fame members Jerry Rice and Deion Sanders. Green, who was second among wide receivers in fan balloting behind Detroit’s Calvin Johnson, has 94 receptions for 1,365 yards and 10 touchdowns this season heading into Sunday’s regular season finale against Baltimore. Burfict leads the NFL with 157 tackles, five more than Jacksonville linebacker Paul Posluszny. He is the first Bengals linebacker to be named to the Pro Bowl since Jim LeClair in 1976. Bill Bergey was selected to the AFL All-Star Game in 1969. That’s some pretty lofty company for a 23-year-old kid who went undrafted because the vast majority of NFL teams thought he had too much baggage coming out of college, complete with a poor attitude and work ethic. It’s not like the Bengals used any of the 10 draft picks they had in 2012 on him but head coach Marvin Lewis formed a personal bond with Burfict during the pre-draft workouts. While others around the league wouldn’t give Burfict a second look after he showed up at the NFL Combine out of shape, Lewis kept close tabs on him and kept encouraging him to work harder. "It’s truly a blessing. I kind of hard for me to really talk about it because I’m still shell-shocked but it’s truly a blessing," said Burfict. "We have a real great relationship. It’s kind of like a father-son relationship. He texted me after we got off the phone and said I’m very happy for you. It’s almost bringing tears to my eyes. I do a lot of praising for him too because he gave me a chance to come here." Burfict also had a lot of praise for defensive coordinator Mike Zimmer, linebackers coach Paul Guenther and the rest of the Bengals defense, especially the linemen. "I didn’t make the Pro Bowl because of myself," said Burfict. "I have great D-linemen in front of me. Domata Peko, my D-ends, Carlos Dunlap and Michael Johnson. They’re the guys that allow us linebackers to fly around and make plays." Burfict has been credited with 188 tackles by the Bengals coaching staff, including 128 solo stops. He’s got 10 pass breakups, seven tackles for loss against the run, three sacks, an interception, two forced fumbles and a fumble recovery. He turned a forced fumble and recovery against Cleveland into a 13-yard touchdown on Nov. 17. The Bengals are ranked fifth in the NFL in total defense, allowing an average of 311.1 yards per game, are sixth in passing (211.3) and rushing (99.8), and are sixth in points allowed (19.2). They have also allowed the fewest red zone possessions (32) of any defense in the league this season. They’ve been able to accomplish these figures despite having lost eight players to injured reserve, including All-Pro defensive tackle Geno Atkins and cornerback Leon Hall. "It’s a great honor for both our guys, and it’s especially great for Vontaze," said Lewis. "Everyone knows what an exceptional player A.J. continues to be, and we kind of expect him to be in the game, but it’s very gratifying to see Vontaze recognized for the fine season he’s had." Green is the 16th Bengal to be selected to at least three Pro Bowls and the 11th one to be selected at least three consecutive times. The others are: Rodney Holman, David Fulcher, Corey Dillon, Cris Collinsworth, Bob Trumpy, James Brooks, Isaac Curtis (4), Willie Anderson (4), Lemar Parrish (4), Chad Johnson (5) and Anthony Munoz (11). Green needs 76 yards to surpass Johnson’s 2007 total of 1,440 yards. He already has club records for most 100-yard games (six) and most consecutive 100-yard games (five). Six catches against the Ravens on Sunday and Green would join Carl Pickens and T.J. Houshmandzadeh as the only Bengals to catch 100 passes in a season. 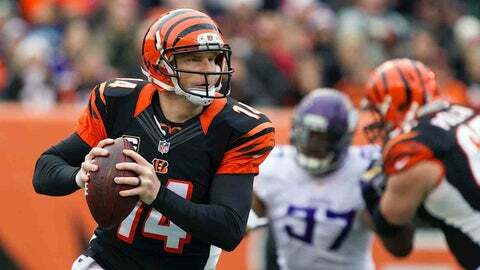 Offensive tackle Andrew Whitworth (third alternate) and quarterback Andy Dalton (seventh alternate) were the only alternate players selected from the Bengals. "For real? That’s crazy. But things falls like that," said Burfict when told he and Green were the only Bengals picked for the team. "I feel like there are way more people on our offense and defense that showcased their ability every Sunday. But there’s also a lot of other great athletes in the NFL. It’s great to at least hear my name announced tonight.